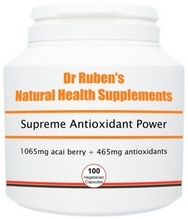 Concentrated acai berry powder PLUS 3 added antioxidants - a powerhouse combination you won’t find anywhere else! 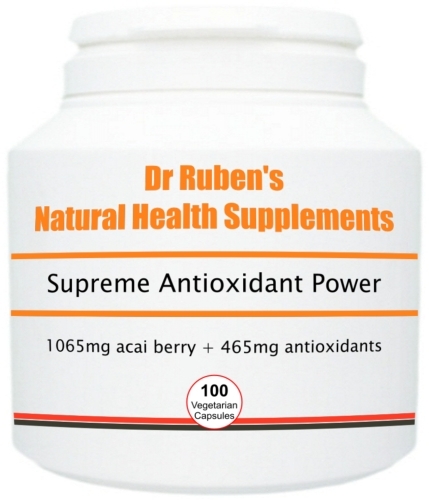 Acai Berry Supreme is our high potency acai berry formulation - 1065mg PLUS 465mg antioxidants per capsule! We have added 3 other hand-picked ingredients to our already incredible Acai Berry - 1000mg for extra antioxidant power - resveratrol, grape seed extract and pomegranate! Acai berries are considered to be a superfruit (it was Nicholas Perricone MD who announced acai berries to be one of the top 10 superfoods of the world), because they are rich in antioxidants and other important nutrients, such as potassium, iron, vitamins B, C and E and essential fatty acids. In fact, pure acai berries have 15-20 times the antioxidants (anthocyanins) that red grapes have!Anthocyanins are an incredibly powerful antioxidant derived from the same essence that gives acai berries their amazingly deep purple colouring. Take 1 capsule, 2 - 3 times per day, with our without food or as advised by your health practitioner.